Pasquale Ferranti is full professor in food science and technology, and research head at the Department of Agricultural Sciences, University of Naples, Italy. He obtained his chemistry degree in the University of Naples in 1987. He has carried out full-time research at the Department of Biochemistry, Imperial College of Science and Technology, London (UK). He is scientifically responsible for international research projects in the field of food science and technology. The most recent research activities are focused on the application of the omic techniques in the study of food proteins and their modifications in consequence of technical processes. Further activities are concerned with the study of the protein digestibility carried out by coupling of in vitro digestion models and foodomics. He has authored over 250 publications in peer-reviewed international journals. He has developed ongoing collaborations with international research institutes in research projects of multidisciplinary interest. He has been an invited speaker at international meetings in proteomics and food technology, fellow teacher in international schools, and scientifically responsible for international conferences. He has served as editor of journals in the sector of food technology, and is at present member of several journal editorial boards, such as Current Opinion in Food Science (Elsevier). He is editor-in-chief of Peptidomics (Versita), associate editor of Food Research International (Elsevier) and editor of the section of Food Sustainability, Security and Effect of Global Change of the Reference Module in Food Science (Elsevier) since 2016. Professor Elliot Berry graduated from the University of Cambridge, UK with distinction in medicine. His principal interests are the bio-psycho-social problems of weight regulation from obesity to anorexia nervosa, and the benefits of the Mediterranean diet; his laboratory research investigates the effects of nutrition on cognitive function. From a synthesis of this work he evolved and published the concept of the “Sociotype” to understand how people cope with life stress and chronic diseases in general, and food insecurity in particular. Berry has published over 270 articles and chapters in books. He has been a visiting scientist at MIT, a distinguished visiting scholar at Christ’s College, Cambridge and a visiting Professor at Yale University. Dr Berry has been a consultant for the WHO, the World Bank and the Serbian Government in Public Health and Nutrition. He was the Director of the Braun School of Public Health & Community Medicine (2003-6) and Head of the WHO Collaborating Center in Capacity Building in Public Health (2007-2013). Berry was a consultant at FAO, Rome (2013-4) where, following his development and publication of the Global Nutrition Index, he worked on indicators for food security and sustainability. 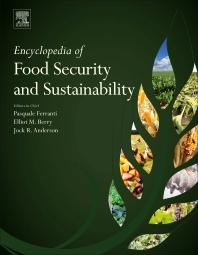 Berry is currently involved as co Editor in Chief of a three volume Encyclopaedia on Food Security and Sustainability (Elsevier) and a-Specialty Chief Editor for Nutrition and Environmental Sustainability as part of Frontiers in Nutrition. These responsibilities align well with current membership of the United Nations Multistakeholder committee on Sustainable Food Systems, as part of the 10 year Framework Program. Jock R. Anderson left his home farm near Monto, Queensland, Australia, to study agricultural science, at the University of Queensland, and after completing his Master’s degree he worked first as a research and extensionist agronomist in the private-sector fertilizer industry. He subsequently pursued a PhD in agricultural economics at the University of New England, Armidale, NSW, Australia, where he stayed on as a staff member, including as Professor of Agricultural Economics, and Dean of the Faculty of Economic Studies, and was elected Emeritus Professor in 1992. During that phase he increasingly focused on development work, beginning with a teaching stint in India and has subsequently worked on all continents. He joined the World Bank in 1989 where he served in various roles including Adviser, Strategy and Policy in the Agriculture and Rural Development Department. As a retiree since 2003 he works for various international organizations, including CGIAR, IFPRI, USAID and the World Bank, and in 2011 led an evaluation of policy work at FAO. He has served as editor of several agricultural economics journals and is a member of several journal editorial boards. He currently teaches as an Adjunct Professor in the School of Foreign Service at Georgetown University, Washington, D.C.